In prepartion for the 2016 games, Olympic organizers are destroying communities, many of which took decades to build. Vila Autodromo resident Armando shows us his house, which the city government of Rio de Janeiro wants to demolish for a 2016 Olympic site. You can’t understand what the 2016 Olympics are going to do to Rio de Janeiro, unless you understand what went into building Armando’s house. Armando is a diesel mechanic who lives in a community known as Vila Autodromo, so named because it sits right outside the city’s famed Formula 1 racetrack. Armando built his home from scratch over the course of fifteen years. Now it’s two stories high with plumbing, electricity, and his own sweat and handiwork in every square inch. The fixtures, the tile, even the wire to a lamp stretched tightly so it hangs behind a framed picture of his son and gorgeous twin grandchildren, bear the marks of toil and love. His home has also been targeted for demolition by the city government of Rio for the good of the next Summer Olympic games. Armando’s situation isn’t unique. 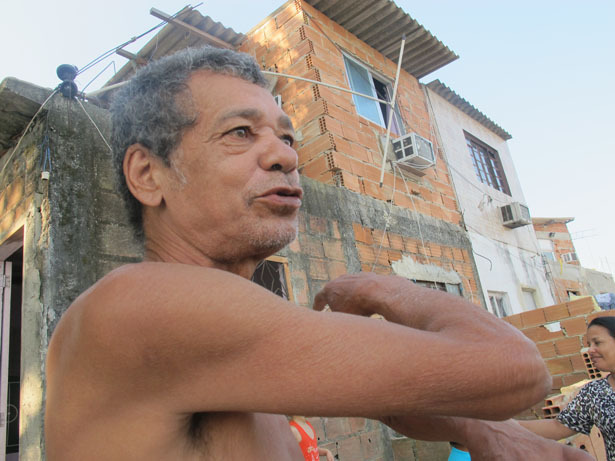 The 3,000 people of Vila Autodromo are all facing forced eviction. Vila Autodromo is a target for several reasons. First and foremost, it’s a favela. “Favela” is commonly translated as “slum”, although that really doesn’t do places like Vila Autodromo justice. All favelas share a common history as squatter settlements that were developed autonomously by Brazil’s working poor and unemployed—with minimal government support. Today, many of them are quite large—sometimes 100,000 people or more—and contain within them a wide range of income levels and employment statuses, as well as churches, schools and small businesses. Many, if not most, favela houses are solidly built with materials not commonly associated with slums, and usually have electricity, running water, as well as Internet access. The Olympic preparations have put these “slums” in the cross hairs of city officials, President Dilma Rouseff and the International Olympic Committee. But to enter a favela like Vila Autodromo is to see a place that could teach the powers that be something about civilization. I don’t want to romanticize the poverty and very real day-to-day struggles to survive many in Vila Autodromo face. But I saw a community where people keep their doors open and children play joyously with each other in the streets. It’s a place where people like Armando’s build and develop their homes over decades to fit their changing families. It’s a peaceful, beautiful community, and herein lies another obstacle to Armando’s keeping his house. It’s too beautiful. The land on one side of Vila Autodromo faces the F1 track, but the other side rests right on a large picturesque lagoon—Lagoa de Jacarepaguá—that looks like it was plucked from a postcard. That means the developers and real estate speculators, according to many residents, drive through salivating at the thought of taking it over. The Olympics provide the pretext. Across the lagoon stand luxury condominiums. The plans for Vila Autodromo are always shifting. On one master plan, it will become a parking lot. On another, a bizarrely serpentine superhighway. The shape-shifting goals obscure the real objective: take over Vila Autodromo. For more on the impact of Olympic construction in Rio, see Zirin’s report on the hundred-year-old Indigenous Cultural Center that will be demolished for Maracanã Stadium parking.